1. I omitted the chocolate fudge part. 2. And instead of 2 swiss rolls I made one large swiss rolls coz of shortage of pans. 3. 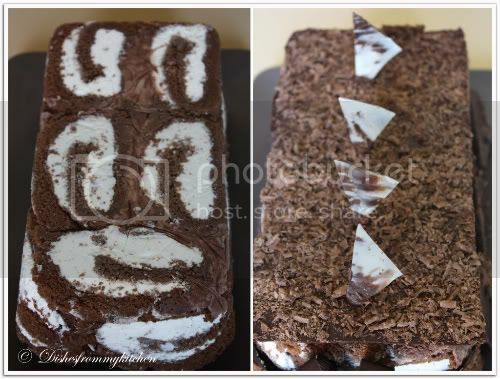 Instead of bombe shape I made rectangular shape. 4. 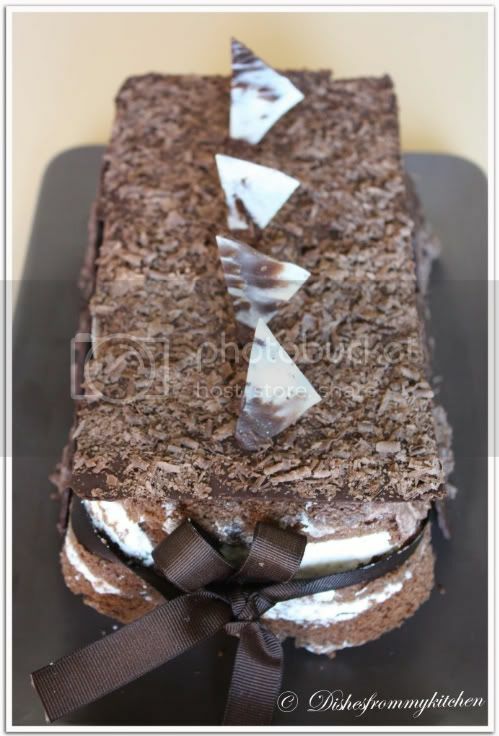 I did not use whipped cream for swiss rolls, instead I used the Vanilla icecream which came out so delicious. 1. Pre-heat the oven at 200 deg C /400 deg F approximately. Brush the baking pans (11 inches by 9 inches) with a little oil and line with greaseproof baking paper. If you have just one pan, bake one cake and then let the pan cool completely before using it for the next cake. 3. Add the flour mixture, in three batches and fold in gently with a spatula. Fold in the water. 4. Divide the mixture among the two baking pans and spread it out evenly, into the corners of the pans. 5. Place a pan in the center of the pre-heated oven and bake for about 10-12 minutes or till the center is springy to the touch. 7. Turn the cake on to the towel and peel away the baking paper. Trim any crisp edges. 9. Repeat the same for the next cake as well. 10. Grind together the vanilla pieces and sugar in a food processer till nicely mixed together. If you are using vanilla extract, just grind the sugar on its own and then add the sugar and extract to the cream. 11. In a large bowl, add the cream and vanilla-sugar mixture and beat till very thick. 12. Divide the cream mixture between the completely cooled cakes. 13. Open the rolls and spread the cream mixture, making sure it does not go right to the edges (a border of ½ an inch should be fine). 14. Roll the cakes up again, this time without the towel. Wrap in plastic wrap and chill in the fridge till needed,seam side down. 1. Grind together the sugar and vanilla in a food processor. In a mixing bowl, add the cream and vanilla –sugar mixture and whisk lightly till everything is mixed together. If you are using the vanilla extract, grind the sugar on its own and then and the sugar along with the vanilla extract to the cream. 2. Pour into a freezer friendly container and freeze till firm around the edges. Remove from the freezer, beat till smooth and return to the freezer. Do this 3-4 times and then set completely. 1. In a small saucepan, whisk together the sugar, cocoa powder, corn flour and water. 3. Remove from heat and mix in the butter and vanilla. Keep aside to cool. 1. Grind together the sugar and the cocoa powder in a food processor . 4.Remove from heat and cool completely before transferring to a freezer friendly container till firm around the edges. If you are using an ice cream maker, churn the ice cream according to the manufacturer’s instruction, after the mixture has cooled completely. 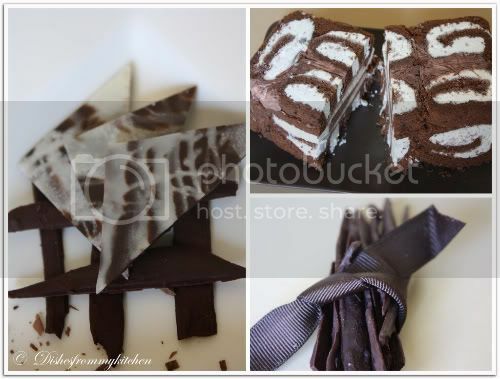 Lovely clicks and a mouth watering, chocolaty recipe. Love your presentation! You are so creative! Great photography too! OMG !!!!! Truly Delicious ... Amazing snaps dear !! 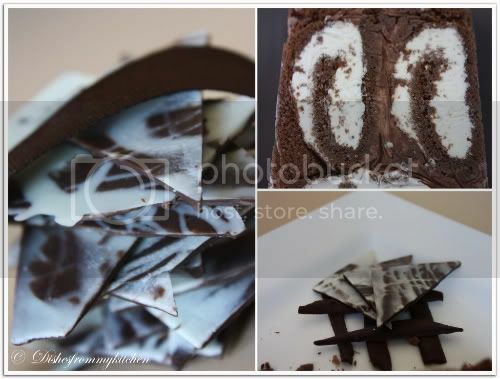 yummy and delicious looking cake.great pictures. title u have wrongly typed 2009. Pavi...appadiye enakku oru gift ah kuduthiringa..Looks awesome! This surely takes a ton of effort - I can see that. And, you've perfected the art of presentation too! The cake looks so delicious ... mouthwatering.. Beautifully done - I love the presentation and the photos are wonderful. Really great work on the challenge. 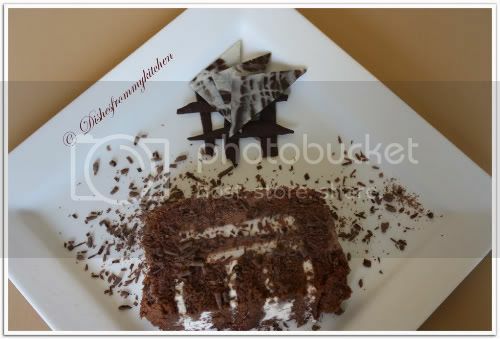 The cake looks so yummy ... the clicks are awesome too.. I'm craving to have a piece for sure . I am sure this ice cream cake is delicious. I'll have to check out this Daring Bakers Challenge. Looks great - awesome presentation. I particularly like the chocolate triangles. Truely speaking I tell...u r very talented....n have lot of patience too awesome job on the daring bakers!! what a sinful delight that is. can I have a piece...even a tiny one will also do. Wonderful and awesome presentation. Pavithra, Parcel pannidu . Lovely clicks dear Looks soo yum! My mouth started watering! Hey sorry for the late comment! You stood out by making it in your own way. love the way you have assembled it. It looks very pretty and inviting. Those chocolate patterns are gorgeous. Your cake looks beautiful! 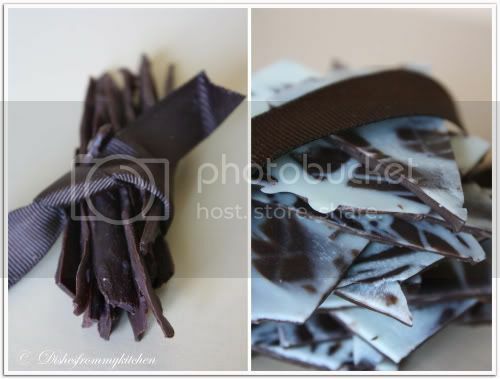 I love the chocolate chards all tied together with the ribbon. Nice job on the challenge! Wow!!! Those are really an awesome and some tempting clicks. Amazing and am craving for it now. 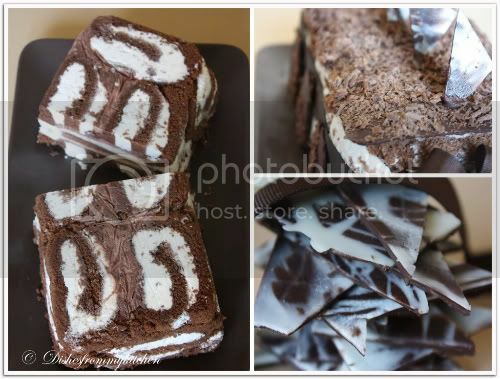 Drooling over the picturess..lovely swiss rolls Pavithra..YUmmy yummy..
Lovely! The loaf shape is very elegant. And why didn't I think of using ice cream as a cake filling? You clever thing! 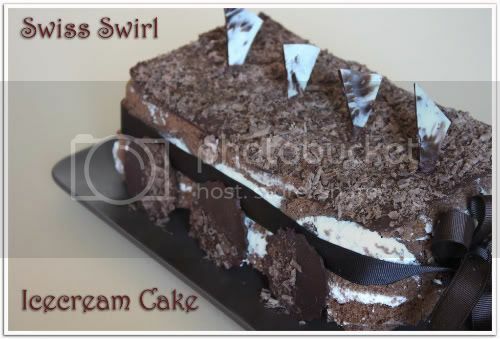 icecream looks amazing..very tempting clicks..
Yummy Cake. The procedure is so long you have so much patience. Wonderful dear. too lovely .... just drooling over them ! Abosultely gorgeous... one of the best of the DBs I have seen around. Awesome presentation, loved all the pics..Great job!! Beautiful icecream cake, looks tempting and yummy. I saw your wonderful photo on the forum and had to follow up...I am so envious!!! I was way too scared to deviate off the recipe and ended up with a replica...which I suppose means that I ate all of the yummy (yet bad for you) whipping cream. Thanks for the inspiration! Your icecream cake looks mouthdrooling. As usual I love the pictures. Unusual and lovely presentation for this month's challenge. beautiful--very creative making the rectangular shape. oh wow, you are killing me with those awesome pics! so tempting. It looks gorgeous! A perfect summer dessert. Love you creation and love those choco slabs on top. Very tempting ice cream cake.. Very creative presentation and decoration! Looks sooooo chocolatey and delicious... I could really go for a slice right now. Keep up the wonderful baking creations.